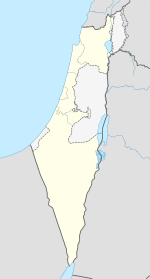 Kiryat Ata (Ebreu: קִרְיַת אָתָא‬; an aa Qiryat Ata) is a ceety in the Haifa Destrict o Israel. In 2015 it haed a population o 55,464. It is an aa still kent bi its umwhile name o Kfar Ata (Ebreu: כְּפַר עָטָּה‬). Aircheological surveys at Khirbet Sharta in the northeast pairt o the ceety revealed traces o habitation datin tae the Bronze, Iron, Hellenistic, Roman, Byzantine, an Mamluk eras. In the early 20t century, the lands o the Arab veelage o Kofrita wur purchased bi a Warsaw releegious foondation named "Avodat Israel" throu intermediaries in the American Zion Commonwealth. Avodat Israel foondit Kfar Ata in 1925, which wis renamed Kiryat Ata in 1965 when the veelage wis merged wi adjacent Kiryat Binyamin. Durin the 1929 riots the toun wus attacked an abandoned. A year later the residents returned an rebuilt the community. The toun wis kent for the Ata textile factory, established in 1934 bi Erich Moller. In 1969, Kiryat Ata wis declared a ceety. The Ata plant, which opened in 1934, became an icon o the Israeli textile industry. It suffered frae financial problems in the 1960s an closed doun in 1985. 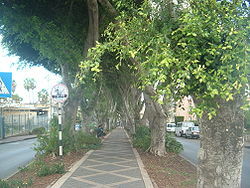 Kiryat Ata haes a Mediterranean climate wi het, dry simmers an ceul an rainy winters. The hettest month is Julie an the cauldest is Februar. Snawfaw is rare, but snaw wis recordit three times in the 20t century: in 1950, 1992 an 1999. Annual precipitation is approximately 524 millimetres (21 in). Accordin tae CBS, in 2001 the ethnic makeup o the ceety wis 99.8% Jewish an ither non-Arab, athoot significant Arab population. See Population groups in Israel. Accordin tae CBS, in 2001 thare wur 23,700 males an 24,900 females. The population o the ceety wis spread oot wi 31.4% 19 years o age or younger, 15.7% atween 20 an 29, 18.5% atween 30 an 44, 18.3% frae 45 tae 59, 4.1% frae 60 tae 64, an 11.9% 65 years o age or aulder. The population growth rate in 2001 wis 0.8%. In 2000, thare wur 17,236 salaried wirkers an 1,226 sel-employed. The mean monthly wage wis ILS 5,157. Salaried males haed a mean monthly wage o ILS 6,759 (a real chynge o 4.6%) versus ILS 3,456 for females (a real chynge o 2.7%). The mean income for the sel-employed wis 6,470. Thare wur 1,092 fowk who received unemployment benefits an 4,153 fowk who received an income guarantee. In 2000, thare wur 20 schuils an 8,762 students in the ceety: 14 elementary schuils wi 4,899 students, an 11 heich schuils wi 3,863 students. 52.0% o 12t graders wur entitled tae a matriculation certificate in 2001. The ceety's main fitbaa club, Maccabi Ironi Kiryat Ata, plays in Liga Leumit, the seicont tier o Israeli fitbaa. The local basketbaw club, Elitzur Kiryat Ata, are in Ligat HaAl, the tap diveesion. Wikimedia Commons haes media relatit tae Kiryat Ata. This page wis last eeditit on 21 Apryle 2017, at 18:32.